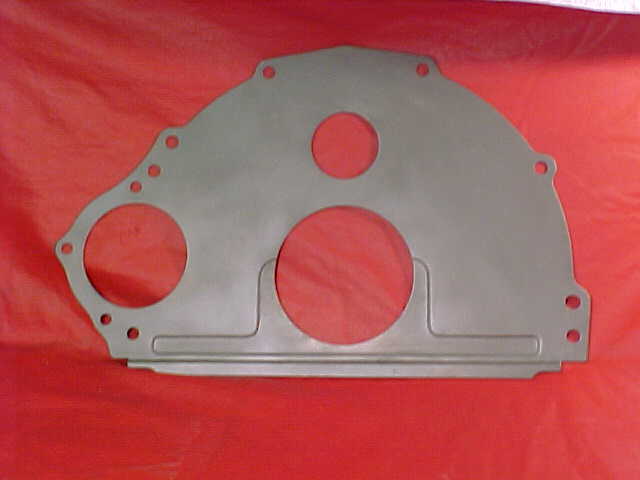 FE engines require a spacer plate between the rear of the engine block and the transmission bellhousing. The picture below shows the plate used for both automatic and manual transmission applications starting with the 1968 model year. Notice the three small holes at top and the large hole at bottom. The rear of this plate is stamped with a date and shift code of "11 28 D3". The large hole to the left in the front view is for the starter. These plates typically have a strip of either cork or weatherstripping-like rubber along the bottom edge, perhaps to provide a seal and to help keep rattling noises down. The service part number for this plate is C3AZ-7007-F. It was used after approximately January 2, 1968, until approximately February 3, 1970. It is associated with engineering number C8OE-6A372-B. At some point after February 3, 1970, the version of the C3AZ-F plate shown above was replaced with the plate shown below. This plate is associated with engineering number C7AE-6A372-A. This version of the plate does not appear to have a stamped date code, but it does have a rectangular FoMoCo stamping. Thanks to Mark Hammons of Toploader Heaven for the picture. 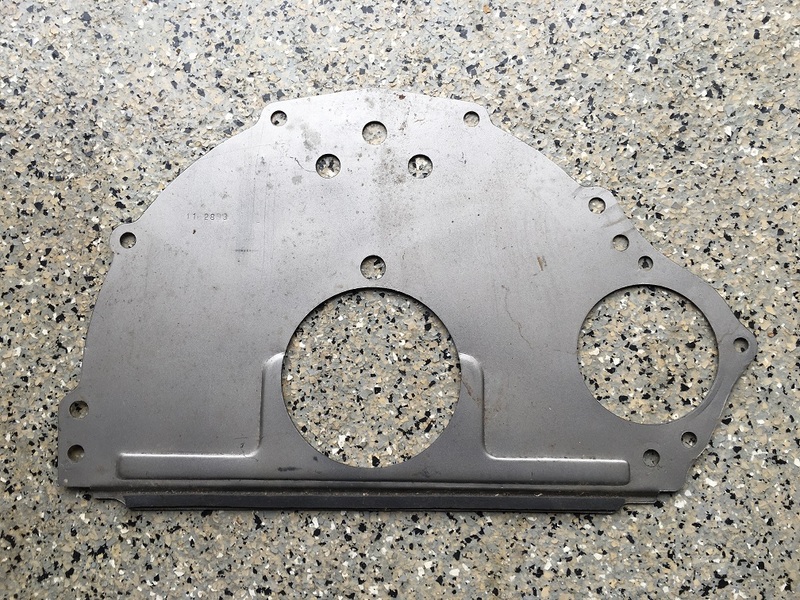 An older spacer plate that is commonly (but mistakenly) thought to have been used with manual transmissions is shown below. 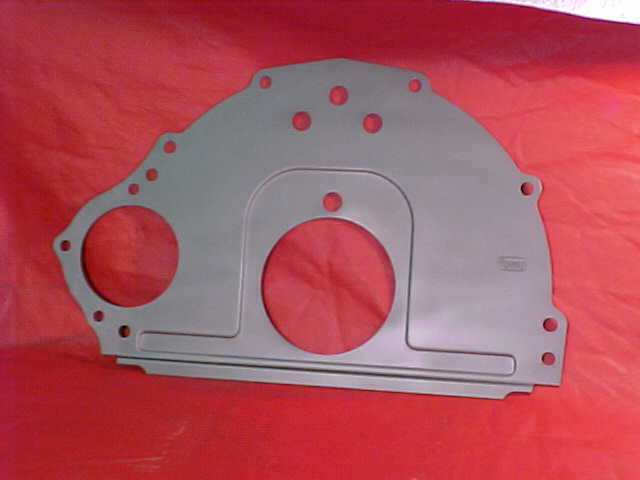 Notice the single large hole at top instead of the three smaller holes found in the C3AZ-F plate. The stamping around the crankshaft hole is similar to the stamping used on the C3AZ-F plate, and there's no FoMoCo stamping at right. 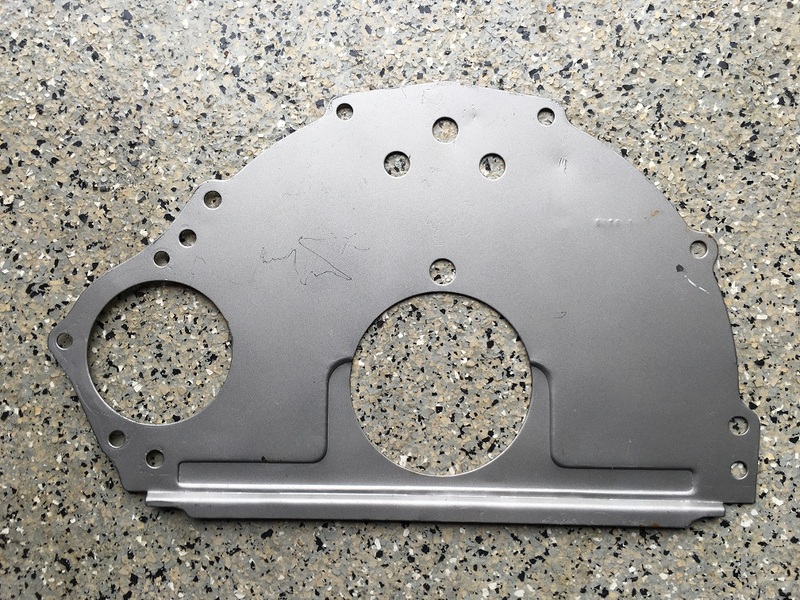 The service part number for this plate is C3AZ-7007-D; it is associated with engineering number C6AE-6A372-A. The confusion may exist because Ford did indeed use different spacers depending on the transmission during the 1960s. Tom Cherry has noted that the "12/63 parts book shows a C3AZ-7007-B for all applications on an FE and the August 65 revision shows a C3AZ-7007-D for an auto trans and a C3AZ-7007-B for a stick shift. In the 65-67 parts book (1/67) they had refined that to one part and it was the C3AZ-7007-D except for special performance" ... "Starting in 68 they eliminated all the other versions as there was no need for them because the -F was needed to clear the new machining protocol and it still fit all the older engines as well". Thanks, Tom, for helping to set the record straight!